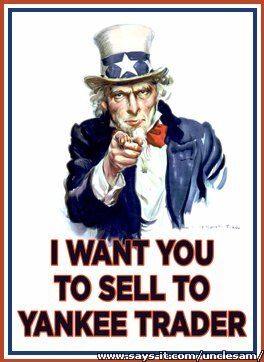 Mark&apos;s Yankee Trader Antiques is always willing to consider purchasing items from you for the website. What I am personally looking for are items of quality and rarity within the wide range of items I sell on this website. I generally pay up to 60% of the expected retail sale of an item. In today&apos;s market, expected retail sale can mean just about anything. Besides internet sales for guidance, I generally consult with individuals of expertise for additional guidance on price. If you have an item you are willing to part with, just send some pictures and your price expectation to info@yankeetraderrelics.com. If you are wishing to dispose of a large collection, drop me a line at info@yankeetraderrelics.com with some details of what you have. If it is something of interest, I will make personal arrangements to look at the collection. What you can expect from me as a buyer is honesty, integrity, and commitment. I will provide you with an accurate and honest appraisal of what you have. I will only promise to purchase it once we have agreed mutually on terms. Thank you for considering Mark&apos;s Yankee Trader Antiques.